Classic Scalloped Ovals LG features 5 scalloped cutting and embossing edges in an Oval shape. Classic Scalloped Ovals LG can be stacked and layered with S4-110 Classic Ovals LG. Classic Scalloped Ovals LG have 22 scallops that scale down as the die templates decrease in size by .25-inch. The difference between die template sizes within a Nestabilities® set is .25 in, which becomes a .25 in border when layering. The difference between LG and SM Nestabilities® sets is .25 in. Combing both the LG and SM sets of Nestabilities® will allow for .875 in borders when layering. 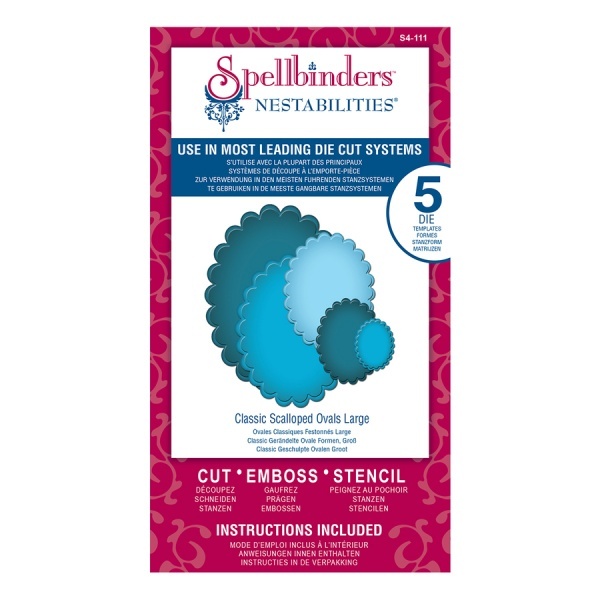 Spellbinders® Nestabilities® cut, emboss and stencil with a single die template. M-Bossabilities - Spellbinders™ M-Bossabilities™ Folders - Two Designs. Twice the Value.